Brand expert, popular speaker, and Fortune 500 advisor Duane Knapp presents The BrandPromise (R), his secret formula for becoming a Genuine Brand. Making the right promise, keeping it, and fulfilling your BrandPromise commitment will transform your business or organization into a "one-of-a-kind" brand that customers, employees, and shareholders will trust and support for years to come. 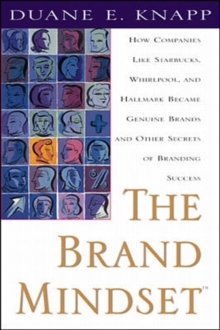 "A brand's promise is the new currency for success," says Knapp, who teaches from personal experience, having built or advised hundreds of successful brands worldwide. Duane Knapp's Promise philosophy has been highly acclaimed and extensively referenced and quoted in hundreds of publications and books. Brand success rests on three principles: 1) Provide a unique experience with products or services that enhance your customer's lives2) Inspire employee partnership, passion, and support3) Create a perception of exceptional value and distinctive benefits and deliver on your promise. Genuine Brands make a promise and keep it. This promise begins with a different mindset than business as usual. It's not just about doing a good job-it's about optimizing the emotional and functional benefits from a customer's perspective. The BrandPromise applies to every type of organization, from associations, philanthropic enterprises (charities and non-profits), and personal brands (celebrities, athletes and executives), to professional service firms (doctors), entrepreneurs, small businesses, and member-centric businesses (credit unions and co-ops). Knapp provides insights from a wide range of executives and leaders with in-depth analyses of many Genuine Brands, including Ketel One, Costco, the Make-A-Wish Foundation, Destination Marketing Association International, SAFE Credit Union, Annika Sorenstam, Callison Architecture, RK Dixon, Bartell Hotels, and Tourism Vancouver. 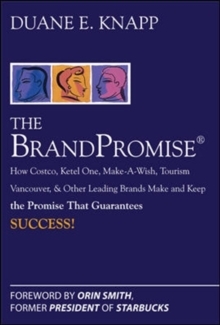 The BrandPromise book reveals the secrets that all kinds of organizations including associations, philanthropic enterprises (charities and non-profits), and personal brands (celebrities, athletes and executives), to professional service firms, such as doctors, entrepreneurs, small businesses, and member-centric businesses such as credit unions and co-ops. The BrandPromise also explains how celebrities can utilize the secrets of BrandScience to enhance their image and perceptions and features a Brand Profile on Annika Sorenstam. According to Knapp, "Annika's strategy is a perfect guide for any individual or celebrity that is interested in optimizing their success. "Great stars may be born, but it's the celebrities that embrace the principles of BrandScience that enjoy long term brand success. "The BrandPromise features insights from other celebrities including Oprah, Greg Norman, and Rachael Ray.